The document provides evidence of the important changes that countries have made to adopt a more participatory, more transparent and/or more comprehensive approach to safeguards including strengthening governance structures, policies, laws and regulations and strategies and action plans, and increasing funding, advocacy and leadership. 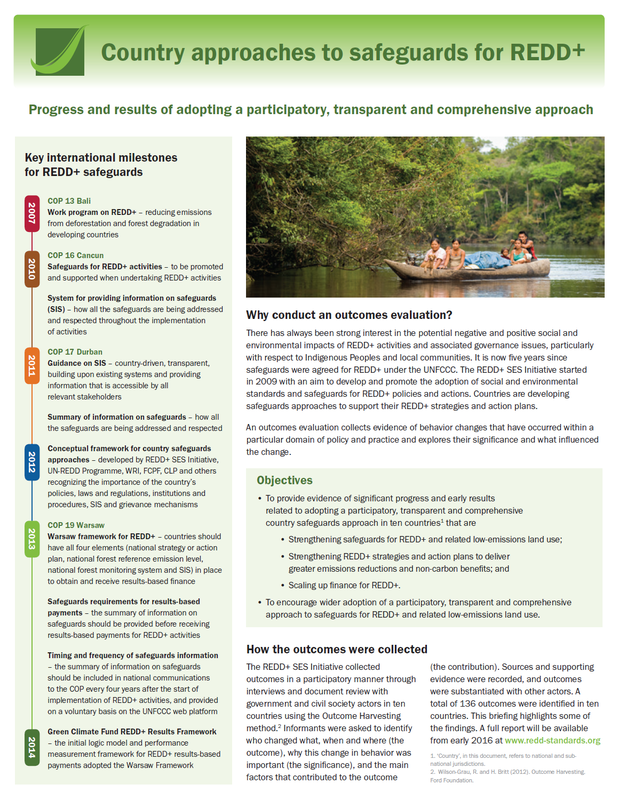 There are also examples of results flowing from the country safeguards approach, including adoption of stronger policies, laws and regulations to protect rights, not only for REDD+ but also for other land use, assertive action by communities to claim their rights, strengthening of REDD+ strategies and action plans to deliver greater multiple benefits, and increased funding for REDD+ activities. These outcomes provide clear evidence of the progress and value of safeguards, and provide insights into the most effective ways to support countries to implement and provide information on safeguards.